Are you a community organization looking to provide Free Breakfast & Lunch to school age children, 18 years and under? We can operate at City Parks, Recreation Centers, Churches and other locations around Cabarrus County. We are a self-supporting entity of Cabarrus County Schools. We participate in the National School Lunch Program and the School Breakfast Program. We also participate in the Fresh Fruit and Vegetable Program Grant, offer universal breakfast at select sites, and provide After School Snacks to sites who qualify. In addition, we have 7 schools qualifying for the Community Eligibility Program (CEP) for the 2018-19 school year. There are 37 food service operations, including the Opportunity School, PLC and two Early Colleges. In 2016-2017, we served 2,770,738 lunches; 1,078,063 breakfasts and 59,352 after school snacks to our students. We employ nearly 300 food service professionals. As a district, SNP has an average overall health inspection of 99.2. All of SNP employees take required sanitation training. All Cafeteria Managers and at least 1 additional School Nutrition employee are required to become ServSafe certified. We currently have 138 employees who are ServSafe Certified. In a CEP School, ALL enrolled students receive a nutritious Breakfast & Lunch at no cost, regardless of family income. What if my student transfers to a school that is not CEP? If your student receives a meal or transfers to a school that is not a part of the CEP program, you will be responsible for the cost of your child's meal. You may aply for Free or Reduced Meal Benefits at that time if you feel your family qualifies. The cost of breakfast is $1.25 for elementary and $1.40 for secondary. Lunch is $2.65 for elementary and $2.75 for secondary. If you have children who are enrolled in a non-CEP school, you will be responsible for the cost of meals provided to the child at that non-CEP school. 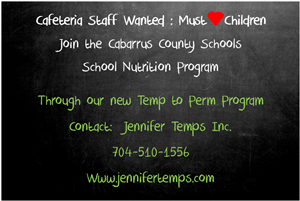 However, if you feel your family may qualify for Free or Reduced meal benefits, you are encouraged to complete a Free & Reduced Meal Application on-line at lunchapplication.com, or see the school Cafeteria Manager for a paper application to apply. What if my child wants extras? CEP covers the cost of a breakfast and lunch meal each day. For an additional entree or snack, you will be responsible to cover the cost of those items. The school system retains control over what links will be placed on system-related websites; however, the linked sites themselves are not under the control of the school system, its agents or its employees. The school system is not responsible for the contents of any linked site, any link contained in a linked website, or any changes or updates to such sites. The school system provides links as a convenience, and the inclusion of any link does not imply endorsement of the site by the school system. The school system reserves the right to remove or restrict any links.